Climate and Geography: Arenal, Costa Rica. Located in Northwestern Costa Rica in the San Carlos district, Arenal is less than sixty miles from the country’s capitol city San Jose. Most of the area is protected by the Arenal Volcano National Park, which contains the Arenal Volcano and an inactivate volcano named Chato, which has a wonderful lagoon. The park is part of the Arenal Tilaran Conservation Area, a 790-square mile area of protected reserves between the Guanacaste and Tilaran mountain ranges, which also contains Lake Arenal. The town of Liberia is just an hour and a half drive away, providing plenty of shopping conveniences, two excellent hospitals (San Rafael and CIMA), and an international airport. 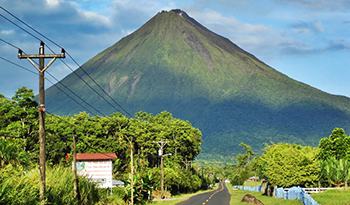 Compared to the rest of the country, Arenal has a much longer green season, lasting from May until January, and shorter high season, from February to April. This keeps the area lush and the rivers and springs flowing. Even during the green season, most of the rainfall occurs in the late afternoon, with sunny mornings and early afternoons. The temperature fluctuates between about seventy and eighty degrees, making it considerably cooler and less humid than many other parts of the country.